Did you see my giveaway that is happening over on my Instagram page? In honor of a successful Celiac Disease Awareness Month across the US, I’ve teamed up with Chebe Bread (both of the e’s are long e’s) to give away an 8-pack variety box of their grain-free bread mixes. Yes, that’s right, GRAIN-FREE!! They are free from wheat, rice, corn, soy, potato, nuts, and basically all the other important allergens. They are made from tapioca flour which gives their breads a crunchy outside texture and chewy inside. Chebe is basically Brazilian cheese bread, commonly known as Pao de Quijo, and is made out of tapioca flour. The ingredients in Chebe are extremely minimal – tapioca flour, tapioca starch, salt, and spices. The cinnamon roll mix contains a slight amount of cane sugar for sweetness. Chebe has six varieties: Original Cheese Bread, All-Purpose Bread Mix, Focaccia, Pizza Crust, Cinnamon Roll Mix, and Garlic Onion Breadsticks. I’ve tried every single one and love them all. They are very versatile. They work slightly different than typical all-purpose flour mixes in that they create a more chewy consistency. Not chewy in a bad way, just not dry and dense like you’re maybe used to. As part of this giveaway, I’ve created three recipes using a few of Chebe mixes. 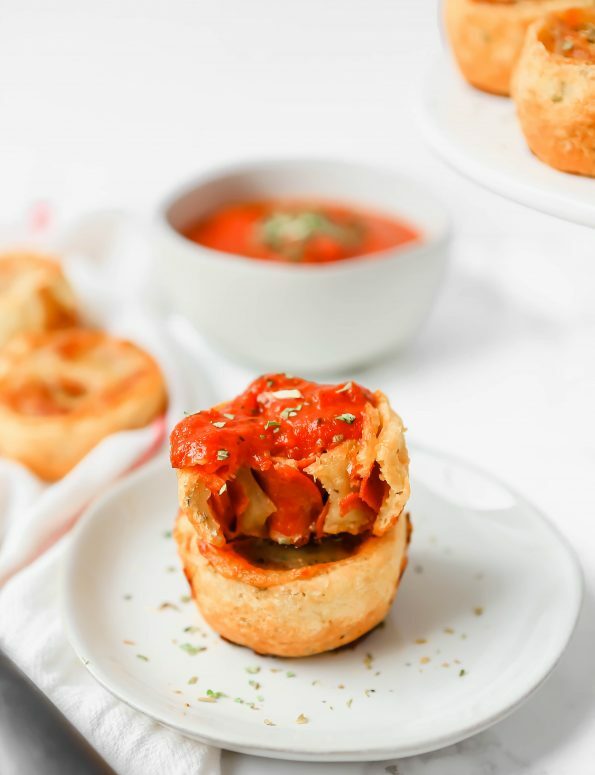 The first one I am going to share is these grain-free pepperoni pizza rolls using the Chebe Pizza Crust Mix. I don’t think these could be any easier. 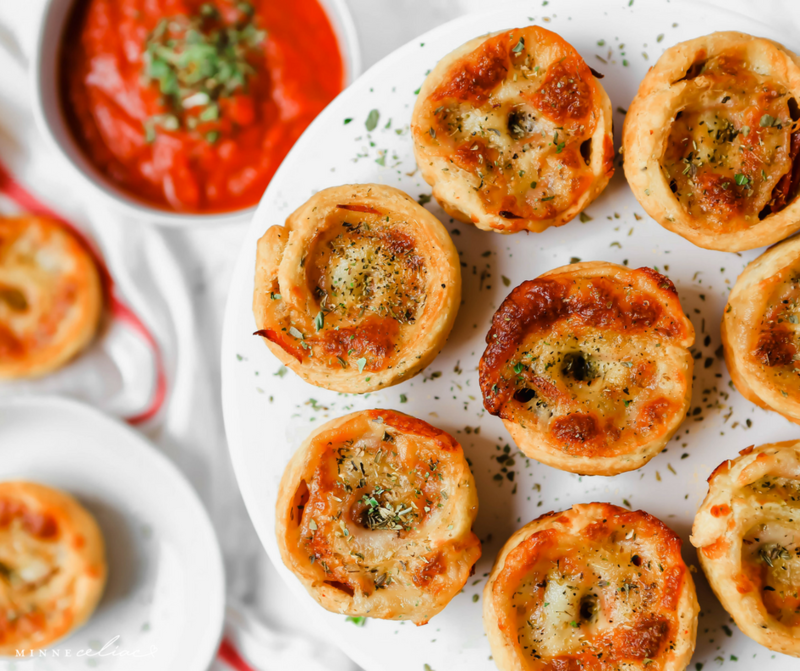 Perfect for a party or for a quick dinner. This is a recipe from my mom’s cookbook that I altered slightly, but it’s the same premise. The only tools you need for this is a 12-cup muffin tin and a medium sized bowl. *I prefer to use olive oil for the Pizza Crust and Foccacia mixes. Canola or vegetable oils can be used, but I love the flavor that olive oil adds to these mixes. *Chebe calls for room temperature eggs to be added to the dry mixes. You can put them in a bowl of hot water for a few minutes to get them up to room temp quickly. *For rolling out the dough I have a Baking Buddy silicone pastry mat that I use and it is AMAZING! Nothing sticks to it. *You don’t even need a rolling pin, you can just use your hands to pull and stretch out this dough. As I mentioned before, this dough can be a little sticky so while you’re rolling it out, you can pour a little olive oil on your hands so it doesn’t stick. Roll out dough jelly roll style to make a 12 inch x 8 inch rectangle. 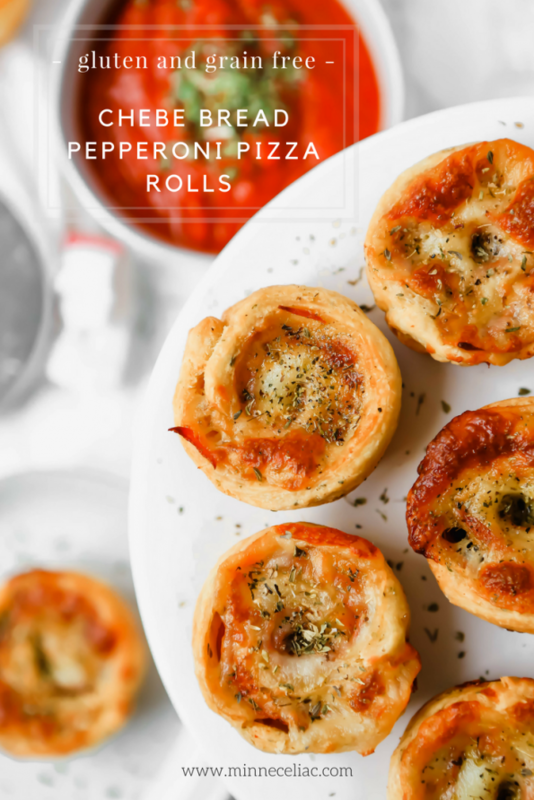 Sprinkle 1 cup of mozzarella cheese over dough all the way to the edges. Place pepperoni slices over cheese. Overlap pepperoni to cover entire rectangle of dough. Sprinkle remaining cup of mozzarella cheese over top of pepperoni. Roll up dough from long side, jelly roll style. Slice roll into 1-inch thick pieces (I’ve found that a large serrated knife works best). Place in muffin tin so the spiral is facing up. It’s ok if some of the cheese comes loose when cutting, just sprinkle the extra on top of rolls before baking. Bake at 350 degrees for 20-25 minutes until golden brown. Garnish with fresh or dried parsley (optional) and serve with warm pizza sauce or marinara sauce for dipping.